We have all rushed out at the last minute to buy something we forgot. It is always stressful. 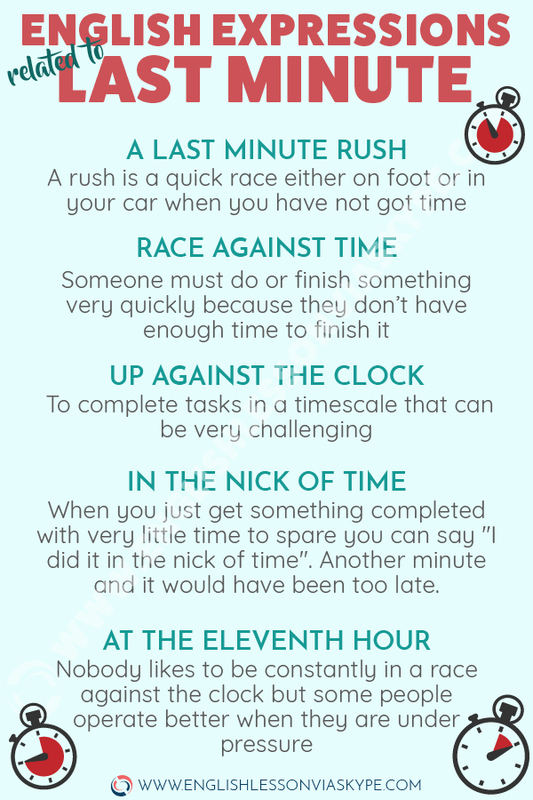 Here are some English expressions related to last minute. We always think we have got everything we need. Whether it is the birthday party for a family member or Christmas shopping we panic when we remember that we should have bought something for your Aunt or a little toy for you nephew or god daughter. So we inevitably have to jump into (get in quickly) the car and head back (return) to the city centre or shopping centre for that “last minute gift”. A rush is a quick race either on foot or in your car when you have not got time. ex. Sorry, I cannot stop and talk to you I am in a rush (in a hurry). A last minute rush is that last (hopefully) run into the city to buy the few things you forgot. Someone must do or finish something very quickly because they don’t have enough time to finish it. We seem to be constantly in a race against time. ex. Michael had a deadline to submit his project at the latest of midnight on the 20th December. As always he did not start the project until the last minute and therefore was in a race against time to get it completed and submitted by the time agreed. People like to give us tasks to complete in a timescale that can be very challenging. ex. My French test had to be completed in 2 hours. I had a lot to do. When I looked at my watch I had only 20 mins remaining. I was really up against the clock and I doubted that I would got all the questions answered in time. When you just get something completed with very little time to spare you can say “I did it in the nick of time”. Another minute and it would have been too late. ex. Although the deadline was tight I managed to finish the essay just as the teacher shouted “time is up” I finished it just in the nick of time. Nobody likes to be constantly in a race against the clock but some people operate better when their “back is to the wall” (under pressure). ex. My brother always leaves things to the last minute he likes the thrill of completing his assignments by the eleventh hour (late into the night). He thinks he does his best work in this way. Going to or Will – How to talk about the future in English?